"This fabulous Whitefriars pattern 9250 lobed bowl vase is a design classic and fine example of the best of the glass blowers art. 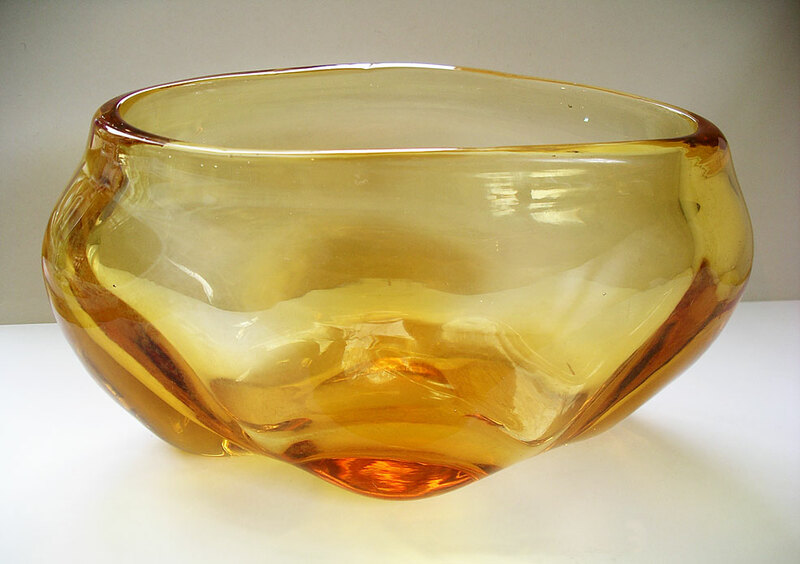 This large heavyweight example in stylish Whitefriars Golder Amber was designed at Whitefriars Crystal by Jame Hogan between 1940 and 1946. It remained in production until 1959. These pieces are becoming difficult to find and are understandably popular with interior designers and lovers of fine style. A real cool decorative arts gem that looks simply great on display." Antiques Expert Hamilton Bear. 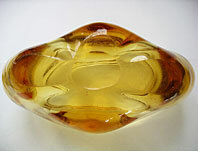 References: Illustrated in the Whitefriars Crystal catalogue 1949 page 2 and 1957 catalogue page 16. Dimensions: length 280 mm max. approximately 11 inches, height 150 mm max. Marks: typical Whitefriars pontil mark to base. Condition: Some scuffing, minor scratches and minor clouding to glass when viewed closely. Two small chips to base. Good overall condition with no restoration. We rate this A1 for display.... a great item!